To read this newsletter in an easy .pdf format, click here to download Weight Wellness. My friend Nicole Barlett, who is the school nurse at the Edgartown School, recently asked me to share some thoughts with her Biggest Losers weight loss group. I jumped at the opportunity, thinking how much fun this would be. We could talk about sugar; fats and metabolism; expansive/contractive foods and how stress, which is contractive and activates fat storage hormones, works against weight loss. I could pack up my long stalk of sugar cane, a few diagrams and be set to go. But, the more I thought about weight loss, the more I felt that topics like sugar and fats were too specific and miss the bigger picture. Isn’t the goal wellness, not weight? And, isn’t the means to this end healthy habits and lasting change that grow not from a prescribed diet, but from a process that takes root from within? Don’t we seek to find our own unique weight “set point” where we feel vibrant and eager to carry out our life’s work, a place where we waste no mental energy thinking about dieting and the number on the scale? I have never written a newsletter on weight loss, partly because finding a comfortable weight is a personal journey. A healthy weight varies with body type, bone structure, and other genetic factors. It is also complicated by stress and lifestyle issues that at different phases of life can work against weight loss and the desire and ability to alter habits in a sustainable way. At difficult times of life, when stress is too great and when we may not have an adequate network of supportive family and friends, trying to lose weight can be overwhelming and self-defeating. Because of mind/body emotional feedback loops, discussed later in this newsletter, the last thing we need to do is to beat up on ourselves, something that can send us straight away to the kitchen in search of comfort food. Also, weight, the number on the scale, is only one input and does not address the greater issue of wellness. Once we have found a comfortable weight where we feel healthy and energized, a scale can keep us on track, encouraging us to make small mid-course corrections involving food and exercise so that we never think of dieting again, but a scale can also be depressing if we “do everything right,” only then to find that we have jumped up a few pounds. Because wholesome fruits and vegetables, as well as fermented foods, help the body retain fluids, the scale may not instantly reward healthy eating habits. The same is true over time if we build muscle by lifting weights, since muscle weighs more than fat. Crowd out food with other activities that nourish the emotions and spirit. It is easy to forget that food is more than just crunch, nutrients, and calories. Emotional factors surround food, something that relates to the way nature built the human body, with multiple feedback loops between the head-brain and the gut-brain. When we feel sad, lonely, angry, or bored, it is easy to try to fill the void or muffle our emotions by turning to food. Eating food registers in the reward centers of our gut-brain, helping temporarily to lift our spirits. Once we appreciate this mechanism, it is easier to recognize this chain of events and alter habits by substituting other emotional pleasures in the place of empty calories. What is a whole food? A whole food is a food that grows in nature, with nothing added or subtracted—a food that is just itself, no more, no less—a food that is not altered, that comes packaged by nature with all its protein, carbohydrates, and fats, vitamins, minerals, phytonutrients, antioxidants, water, and fiber to support our health. All these ingredients work together synergistically as a system to nourish the body in ways that defy the scientific microscope. Whole foods are designed to be consumed with all the edible parts as perfectly balanced nourishment for the human body, which is also a system. Let’s think about the body for a moment. It is a macro-system made up of many independent micro-systems all working together for our benefit. We have a circulatory system, a digestive system, an immune system, to name a few…and they all work together to support our health. And what is a system? It is any group or entity that is designed to function with all its vital parts. Cars, computers, televisions, and cell phones are systems. Every part is essential to the whole…remove a chip, a wire, or a connection and these no longer work properly. Groups of people working together are also systems—doctors and technicians in an operating room; the cast and production crew of a Broadway musical; and any group playing competitive sports. When one part is missing, the system is compromised. When a part is added or subtracted, behavior changes, often in unpredictable ways. As systems ourselves, we are genetically programmed to consume foods in their whole form, with their vital energy intact. We have been eating whole foods for the last 42,000 years. And, over thousands of years, we have evolved just the right software to digest and assimilate whole foods made according to nature’s blueprint. In contrast, manufactured foods, with ingredients that are added and subtracted, change the dynamics of a food in ways that are hard to predict. Behavior of non-food systems when components are altered. First, let’s add something to a system and see what happens. If we consider the flow of traffic on a typical super highway—drivers behaving as a system according to certain rules of the road, while some motorists speed along their way. We all know what happens to driver behavior when a state trooper appears. Here, behavior is predictable… drivers slow down and check in with their speedometer. Families are also systems, of course. When we add or subtract a member, the dynamics change. I have a friend in Boston with five children and a Vermont ski house that the family uses on weekends. His trick to raise the family behavior a notch or two is to allow, on a rotating basis, each child to invite a friend. Inserting a non-family friend into the mix is an investment in good behavior by all. Now, let’s think of subtracting something from a system. In ice hockey, what happens to team strategy when a player is sent to the penalty box—play is compromised and the team suffers. Or, let’s take a different example. What about a classroom of young students, when a teacher momentarily steps away? We can be sure that student behavior will change— this time in unpredictable ways. Implications for foods when they are fractured, supplemented with chemical additives, or genetically altered. Of course, the idea to take away is that when we fracture foods or add synthetic ingredients or alter genes, we cannot predict the outcome for the body. Manipulated foods have not stood the test of time. When we eat fractured, artificial foods with added and subtracted ingredients, we simply cannot know all the ways that we might be compromising our system. Examining food under the microscope cannot fully predict how fractured foods, food additives, or genetically modified foods will affect the body over the life span. Inserting artificial/synthetic food additives to fractured foods in an attempt to make them more palatable can set off a cascade of untoward change. Carrots versus carrot juice.1 Four or five carrots are necessary to make a glass of carrot juice. Juicing strips away the fiber and the crunch, and the satisfaction from chewing. When we down juice in a quick sitting, the body never has a chance to feel the satiety derived when we consume carrots in their whole form. And, drinking the juice can send us in search of a bag of chips to satisfy the crunch that is missing. How many carrots would we eat if, instead of juice, we ate the carrots in their whole form? Sugar cane versus refined sugar. Nature gave us sugar cane, a sweet treat packaged with water and micro-nutrients encased in a tough band of fiber. Complicated, capital-intensive processing and refining equipment is needed to strip away 99% of what makes sugar cane—mostly fiber (nature’s safeguard designed so that we do not eat too much), as well as water and macronutrients—leaving behind the pure chemical we call sugar. It takes one foot of sugar cane to make one tablespoon of sugar, something we might easily consume with our breakfast coffee and cereal; and another three feet to sweeten the can of soda we might drink later over the course of the day. Sugar is the most fractured food in common use. It is dehydrating, upsets metabolism, and sets up cravings for its missing nutrients. Walnuts in the shell versus commercially-packaged nutmeats. As a child, I had to crack walnuts for my mother, something that made me wonder why she insisted on adding them to her brownies and cookies. Today, purchasing bags of nutmeats at the super market is quick, easy, and inexpensive. Eaten from the bag, as my family likes to do, nuts are easy to over-consume (in excess, they can burden the liver). The difference between whole foods as systems versus fractured foods is really this: When we fracture foods, we destroy the natural balance, we remove the inherent safeguards designed to protect us from mindless over-consumption, and we set up cravings as our body looks for the missing ingredients—ingredients that it is programmed to expect. Also, convenience processing methods remove the life force energy of foods, as well as many of nature’s efforts to package nutrition in ways that satisfy us. The ease with which we can purchase processed foods, with little effort and connection to plants and animals, plays a role in our present obesity/diabetes problem. Manufactured, fractured foods also disconnect us from the food chain and the sense of awe and gratitude of our forebears whose livelihood and existence depended upon a close connection with plant and animal life. Concept Two: The Enteric Nervous System (ENS) and Head-Brain Pleasure Centers Can Be Satisfied in Ways that Do Not Rely Upon Food. 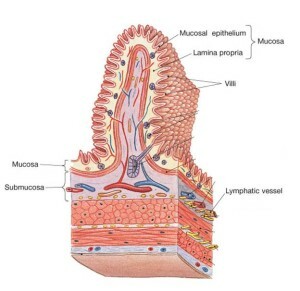 The enteric nervous system, the “gut-brain” is found in the mucosal lining of the digestive system, between the muscular layers of the esophagus, the stomach, and the small and large intestines. It is a complex network of neurons and neurochemicals that sense and control events in the digestive tract. The ENS can read and respond to sensory inputs from other parts of the body, including the brain. 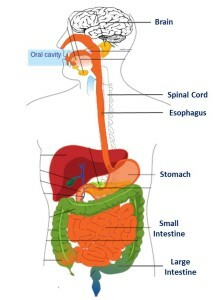 There are over one hundred million nerve cells in the gut-brain—as many as are found in the spinal cord. More than the head-brain, it is the gut-brain, with its feedback loops to the brain,that helps set our food preferences, while it also controls how we digest and assimilate nutrients. Concept Three: The ENS and Mind/Body Feedbacks Can Undermine Attempts to Diet and Lose Weight, Especially If These Efforts Are Accompanied by Feelings of Denial and Guilt. 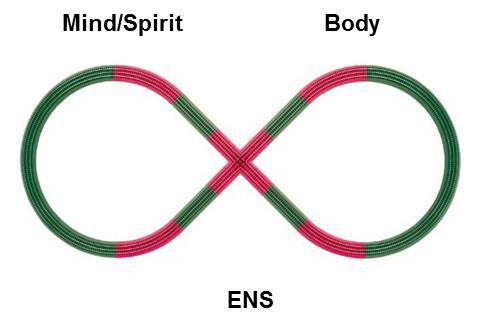 Through the brain, spinal cord, and ENS, the Mind/Spirit and the Body communicate in continuous feedback loops. We can choose to use this concept either to benefit our health, or to work against it. If we wish to improve our well-being, we can choose any positive activity or mindset, any point on this continuum to enhance our present condition: Anything that we do to lift and improve our body—through sunshine and fresh air, exercise, whole foods—can feed back to improving our mood and mental outlook. Likewise, anything that lifts our spirits and fills the empty spaces in our lives—nature, loved ones, gratification from helping others, gratitude, spiritual practices, laughing, music, artistic endeavors, working with plants or animals—can have a positive effect upon our body chemistry and fill us up so that we are less likely to turn to food. By the same token, and in a negative way, denial and guilt—the mind/spirit beating up on the body through destructive neurochemical messages—can backfire. These feelings can send us to the refrigerator in search of food in an attempt to drown out our own verbal abuse and brow-beating. [See Appendix: Triggers to Overeating.] The mind/body model can serve as an ever-present reminder of the potential negatives associated with self-deprecation, denial and guilt. Denial: When we deny ourselves “forbidden fruits,” they often grow ever larger in our mind and cravings. Thankfully, when we shift to eating more and more whole, nutrient-dense foods the feeling of denial fades into the background. Over time, a hot fudge sundae and a Snickers candy bar lose their appeal, and sugar and other denatured “treats” no longer loom as great temptations. Guilt: We all make food mistakes. We can be grateful that our body talks to us, providing feedback to help us change. It is pointless to overlay the fallout from mistakes with an added feeling of guilt; our body and our emotions have already paid the price to right themselves. If we want to blame someone, perhaps it should be Big Food. When we overeat, we may simply be the victim of the food industry which engineers foods with just the right combination of sugar, fat, and salt—“too-good-to-be-true” food—that sets up cravings for more. Food mistakes: We all make these, in varying ways and by varying degrees. Mistakes are lessons, nothing more, nothing less. All we have to do is pay attention to how we feel so that we can hope to do better the next time. To avoid negative chemical reasons from mind/body feedbacks, try to resist charging these episodes with emotional layers and self-flagellation. “Don’t go out of your weigh to please anyone but yourself”…author unknown. Chewing: One of the best ways to lose weight and prevent overeating is to chew every bite 30 times. It is also one of the best antidotes to a feeling of denial. Sleep: Sleep is critical to a strong immune system, to prevent cravings for carbohydrates and stimulants, and for hormonal balance (particularly cortisol, which is associated with belly fat). Adequate sleep is a powerful tool for weight loss and/or healthy weight maintenance. Stress: Chronic stress and stress-related hormones like cortisol are linked to belly fat. Try to put a margin of time in each day for the unforeseen and allow yourself time to decompress. Scales: We can use a scale as a good way to check in with ourselves, but it will never tell us how healthy we are or the status of our belly fat (belly fat is important because it is linked to chronic disease). When we eat nutrient-dense whole foods and exercise in whatever ways make us happy and feel good, the body takes care of the rest, especially if we avoid feelings of guilt and self-deprecation. Supportive Networks: Share meals and exercise with people who support your healthy food/exercise goals. A network that does not support your efforts can quickly undermine resolve and good intentions. Gauging Satiety: Alcohol, juicing, or daytime fasting to save up for a big evening meal can prevent us from gauging how much food we really do need. By consuming enough nutrition early in the day when digestive fire is at its best, we honor our body’s natural clock and support body chemistry. Flexibility: Try not to lock yourself into rigid rules and declarations. Grand dieting pronouncements might be off-putting to friends who have chosen different paths. Perhaps more importantly, each one of us has physical needs and taste preferences that may change over the years. A strict vegetarian, for example, may feel fit and fine for a time, but might someday want to incorporate traditional animal fats and easy-to-assimilate animal proteins for a more well-rounded approach to good health. Any strict diet—Paleo, vegan, vegetarian, low-fat, low-carb, etc.—can lock us in and, when we veer off course, make us feel we have failed, when, in fact, we may simply be honoring our body’s natural cravings for balance and missing essential nutrients. If you are trying to eliminate something like coffee or sugar, you may need to be strict for a period of time to get your body to the point that it no longer has cravings. Later on, when your tastes have changed and your body is in a different place, a little sugar or coffee can be handled on occasion. Preventive eating: When you crowd out unhealthy temptations with nutrient-dense calories, you are on your way. I call this “preventive eating.” Eat a hard-boiled egg or similar sustaining snack before you go to a cocktail party/dinner. It will satisfy you so that you can better gauge how much food and drink you really need. Go to social events to be filled with good times and fun with friends, making food and drinks a side dish. Preventive cooking: Preventive eating is rooted in “preventive cooking,”—cooking in advance so you have plenty of healthy snacks on hand and foods that can be combined quickly into meals in five minutes or less. Planning is the most important part of this strategy. Then shop and cook when you have windows of time, choosing to prepare foods that require little supervision. In conclusion, the ultimate test is to ask ourselves how we feel. Do we have energy to carry out our life’s work while having fun along the way? Attention to our waist might be better placed on our waste and on our environmental footprint. Trying to shrink our footprint for the benefit of future generations can be empowering; it can make us feel good; and in its tracks, we may find that weight loss is a hidden benefit. When we switch from counting calories and obsessing about weight to preserving our health and the health of the planet, we have won a battle. Some Concepts from Contemporary Science to a New Understanding of How Food Affects Health.